Anne Turner Beletic has been Board Certified in Family Law since 1990 and has practiced exclusively in family law for over 25 years. She is an experienced litigator, negotiator, and collaborative law professional. She specializes in complex divorce property and custody cases as well as jurisdictional disputes, interstate custody and child supports claims, modification of support, conservatorship and visitation and pre and post marital agreements. Although most of her cases settle, she is well trained and experienced for court if the case requires it. 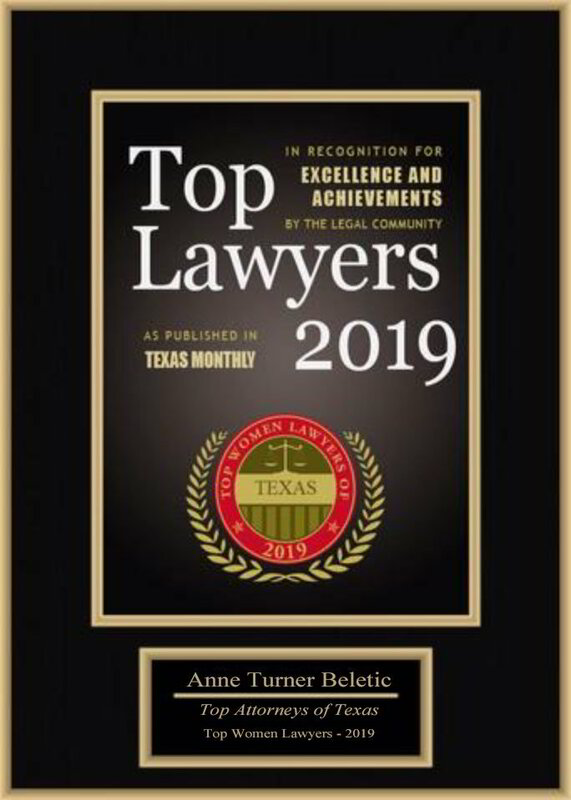 Ms. Beletic is a Fellow of the American Academy of Matrimonial Lawyers (a prestigious national group of family law attorneys), the Texas Academy of Family Law Specialists and a member of the Family Law Sections of the State Bar of Texas and the Dallas Bar Association. She is also a Fellow of the Dallas Bar Foundation, and a member of the Collaborative Law Institute. She has been a featured speaker and author at the Advanced Family Law seminars and the National Council of Juvenile and Family Court Judges and has taught on numerous subjects, including summary judgement, visitation, child support, alter ego, fiduciary responsibilities in divorce, bankruptcy and family law, piercing the corporate veil, drafting and enforcement of property orders, and discovery. Prenuptials, Domestic Violence, Enforcement and High Net Worth Divorces. Experienced in all Aspects of Family Law. My divorce was finalized in 2003, so I have had enough years to provide a long term review. Anne is someone who will not get caught up into the emotion of a divorce, as that can become long and costly. Her efforts are used strictly to get to the intended goal, not to waste time (and your money) to fight an unnecessary fight. In my case, the other counsel was much more interested in filing wasteful motions, writing unnecessary letters, etc...basically being a needless impediment in the process. Anne would not go down those rabbit holes, and she stayed above board and on point. In my case, I was in Kaufman County, and, as a father seeking rights to my children, the odds were astronomically against me. I hired Anne after the initial temporary orders had been submitted, and had to undo the mess that was done by my first attorney, and it was quite the mess. She handled it skillfully, tactfully, with great poise, and was ultimately successful. She never left me wondering if I was being fairly represented, as it was evident at each and every interaction. I could go on and on about Anne. She set the groundwork for a modification to the original orders 5 years later which ultimately had the children move in with me, and I was the primary custodial parent. As the saying goes, you get what you pay for. With Anne, you get the best. I honestly don't know where I would be if it were not for her. In the end, I survived; Anne protected me and helped me keep what was most important to me, my daughter and part of my retirement. We believe Anne Turner Beletic provided us with the best family law counsel we could have received. I contacted Anne when I was in need of a protective order against my son's father. Not only did she help me every step of the way in getting that, she is helping me work out some other very complicated details related to a custody agreement in another state. Ms. Beletic represented me in a very difficult divorce, and did a very good job walking me through it. At each stage of the process, I felt like I had a good understanding of what we were doing and why. While she took the time to really work with me to put everything together, she also advised me on how to prepare for our sessions so that they were most effective. I really appreciated her ability to get to the heart of a matter quickly and ensure an accurate and strong line of questioning, and her compassionate explanation of difficult situations. I would definitely recommend her to anyone in need of her services. Choosing a lawyer to work with on a sensitive matter such as divorce and family law is not easy. It's important that the partner you choose is deeply experienced, highly trustworthy and confidently articulates the way through the process and achieving the agreed results, and shares and supports your values. Anne fulfilled all these and as importantly, when needed, exerted the right level of "pressure" to get to the best possible outcome. I would highly recommend Anne, she is top notch, highly competent and a great partner to see you through the process.